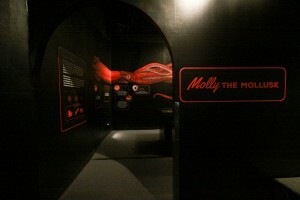 Molly the Mollusk is back! 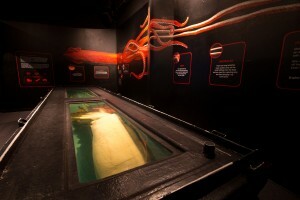 After a two year hiatus, Molly, our 27-foot-long preserved giant squid, is finally home. Molly was accidently caught by a deep sea commercial fishing trawler off the southeastern coast of New Zealand in 1999, she was then donated to Mote. Since encounters with giant squid are rare and distant, let our Exploration Gallery take you on an epic journey from myth to reality. Did you know the giant squid has the largest eye in the animal kingdom? Come see for yourself! 2115: The Future of our Coral Reefs - Did you know that many human activities release carbon dioxide into the earth’s atmosphere? The oceans absorb this excess carbon dioxide causing harmful ocean acidification. This interactive exploration takes us to the year 2115, and shows us what our coral reefs may look like if ocean acidification continues. Chew on This - Features the real teeth of a Mako Shark. Learn about sharks, their endless supply of teeth, and their diet. Sea Monsters – Who’s the biggest monster of them all? The answer may surprise you. Interactive Earth – Come explore your planet Earth with NOAA's SOSx Technology. 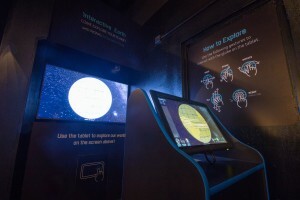 Science On a Sphere® (SOS) is a room sized, global display system that uses computers and video projectors to display planetary data onto a six foot diameter sphere, analogous to a giant animated globe. Researchers at NOAA developed Science On a Sphere® as an educational tool to help illustrate Earth System science to people of all ages. Animated images of atmospheric storms, climate change, and ocean temperature can be shown on the sphere, which is used to explain what are sometimes complex environmental processes, in a way that is simultaneously intuitive and captivating. 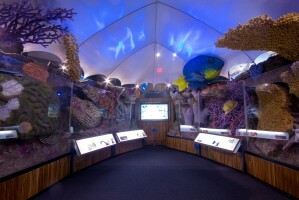 Our traveling exhibits, Sanctuary Reef and Discovery Reef, may or may not be featured in our Exploration Gallery at your time of visit. To learn more about them, click here.